I spend a lot of time in a browser and this one makes my life easier. I find that most home care people either use Internet Explorer (because it comes on their PC) or Safari (because Macintosh people generally believe that Apple does everything best). I'm fond of both Microsoft and Apple, but I use Chrome for speed and convenience (I like Google too - they make Chrome). 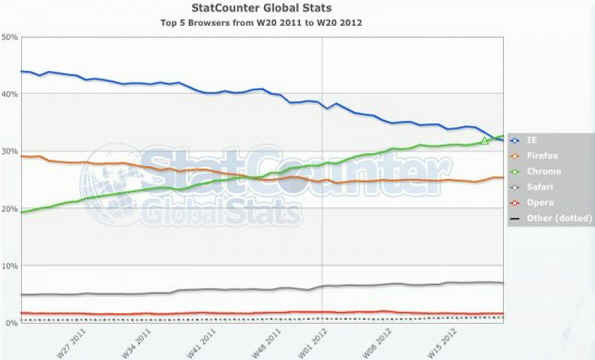 The number 3 browser is FireFox and programmers (including my programmers at Ankota) seem to prefer it. I asked my lead developer why and he explained that there are a lot of developer tools that he can plug in (for example to analyze the software while testing). Here's a graph showing market share over time that I found at http://www.businessinsider.com (you can view the article by clicking on the graph).